Image via: University of Washington coursera. 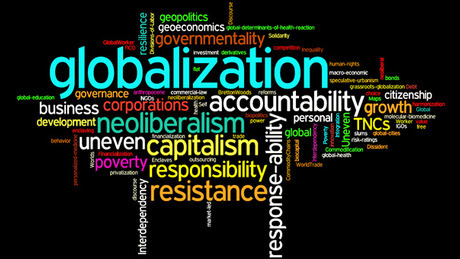 There are many dimensions to globalisation and they are constantly changing and varying in their composition: the trade in goods, capital flows (both of these are currently in decline), information flows (on the increase) and the movement of people (also rising, with huge problems). There is also cultural exchange and even hybridisation, among other phenomena. As Lionel Barber, editor of the Financial Times (now owned by the Japanese Nikkei corporation, another change) argues, we have lived through ‘Globalisation 1.0’. And we are now in Globalisation 2.0, which means ‘the interdependence of several identities or cultures characterised by new forms of non-western modernity’. The part about non-western is important, not only for this new brand of globalisation, but also for global governance and the world order, which the West can no longer impose. In any event, recent years have shown that Thomas Friedman was wrong to propose that the world was flat. Far from it: it is highly contoured, even if the world economy has lately shown the tendency to flat-line. This was one of the subjects under debate at the Second Foro de Foros Intergenerational Encounter held in La Granja, running from 3 to 5 March. Is the choice between globalisation and more regionalisation? Or, as a recent excellent report from Credit Suisse put it, are we moving towards the end of globalisation or a multipolar world (not necessarily the same thing as multilateral, or even close)? Certain factors are identified as potential game changers, with three in particular standing out (the analysis adds a fourth: food and obesity). First there is the digital world. Services, products and even money are becoming increasingly digital. And digitalisation is one of the elements that drives globalisation, although products and services are now more on the move than workers, despite the growth of migration in absolute terms. But we still do not inhabit a truly globalised digital realm. Globalisation’s second game changer, although this may come as something of a surprise, is the growing automation and robotisation of many tasks. This may lead to a more connected world, but may also trigger more fissures, since not all countries can or will be able to develop competitive robotic and robotised industries. Currently there are three large manufacturers of robots: the US, Germany and Japan. Although China is the country that installs most robots in its factories, they are very often made in Japan or elsewhere. Added to this is the likely impact of increasingly sophisticated 3D printers (or ‘additive manufacturing’), which could lead to a slowdown in the international trade in components and even finished products. They could, in other words, disrupt the famous value chains that underlie globalisation. This automation (as well as the rising labour costs in China and elsewhere) accounts in part for the reindustrialisation that the US, for example, is currently witnessing. There is a third factor that could end up going one way or the other: Internet security. As indicated above, the Internet makes the world more interconnected, although some countries and regimes, such as the Chinese, have their walls to prevent their citizens from having excessive and uncontrolled access to external sources. On the Internet, geography, and therefore geopolitics, continues to matter. It is not for nothing that Google has its servers located essentially on US and to a lesser extent European soil: in other words, in reliable jurisdictions, although it is now extending to others. In 2007, in a book of the same title, I wrote about ‘la fuerza de los pocos’ (‘the power of the few’), in reference to how the new means of communication, the Internet and mobile telephones, were enabling individuals and small groups to obtain a global reach, sometimes with radical messages, as in the case of al-Qaeda or, currently, the Islamic State, simultaneously connecting and fragmenting the world. Daesh and Facebook use the same communication technologies. These trends have become stronger. And the next war could start not with a missile being launched, but rather with a cyber-attack. When people talk about the lack of global governance, however, it should be remembered that there are systems that work, such as the postal system, the management of the Internet, air and sea traffic control and the International Organization for Standardization, the ISO, which is essential for the standardisation of robots, for example. It might even be said, citing as examples the way the UN’s new Sustainable Development Goals for 2030 were reached, or the Paris COP21 agreement on the fight against climate change, that we are in the presence of a new type of ‘bottom-up’ or ‘inductive’ global governance, emanating not just from States, but also from their citizens, think tanks, NGOs and even philanthropy, Bill Gates-style. (3) the end of globalisation, in a similar way to what happened after 1913, with less cooperation between States. To a large extent it depends on how the factors mentioned above materialise, or how the tennis ball, as in Woody Allen’s Match Point, lands or is made to land.